Azamour, pictured in Belmont Park where he finished an unlucky third in the BC Turf, where Des and I where lucky to be part of the Team! Third Intention wins at Cheltenham and a return to his Home is on the cards! The very popular Azamour has had a very good week: yesterday a two year old son of his topped day 1 of the important Craven Breeze Up Sale at Newmarket with a fantastic price of 315k! 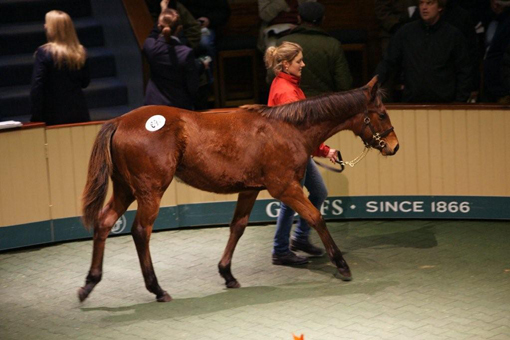 He was bought by Sir Robert Ogden and consigned by Willie Brown of Mocklershill who paid 56k for him as a yearling. 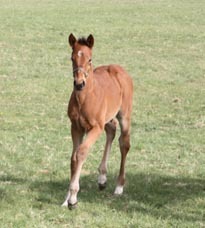 Incidentally the colt is out of Khayrat, a close relative to our own mare Khatela. 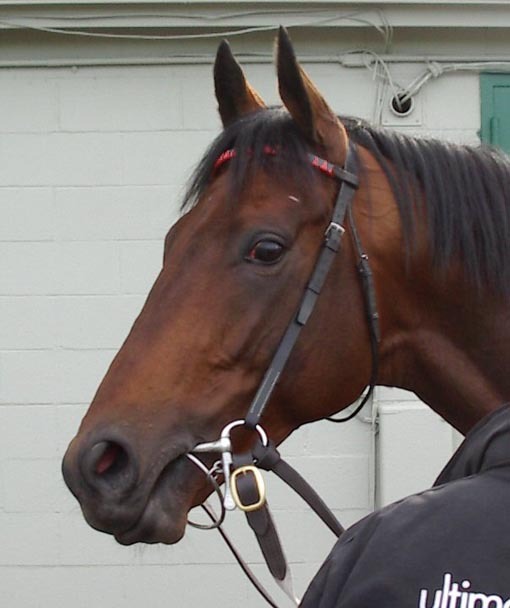 Today Azamour\'s son Native Khan won the Craven Stakes at Newmarket, Gr. 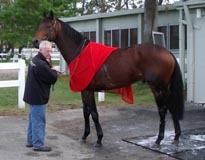 3, a well recognised trial for the 2000 Guineas. And last but by no means least he had another winner, this time over hurdles at Cheltenham with our lovely homebred Third Intention. Of course Azamour is also the sire of Champion Juvenile hurdler Zarkandar. So as we all expected, Azamour is rapidly proving himself to be a versatile sire of top class horses on the flat and over jumps. UPDATE: 17.04.: Azamours daughter Siren Song wins a Listed Race in Naven and puts herself into the English/Irish Oaks picture. Zanughan, a son of Azamour, wins a competitive maiden race in Navan on his only second start. He has an Irish Derby entry. 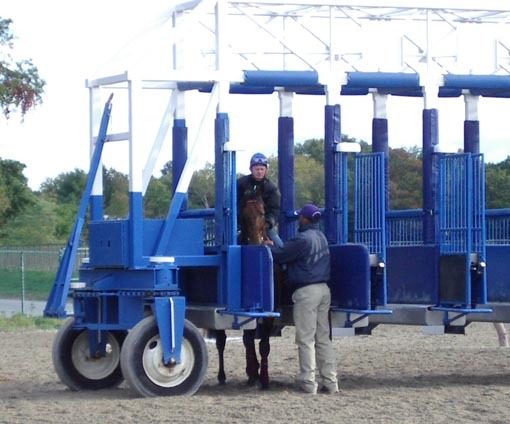 Azamour has two more stakes winners, one in Germany and one in Canada. Impressions of Azamour at Belmont Park before running third in the Breeders Cup Turf. After being withdrawn due to a stone bruise in the Grade 1 4yo hurdle at Aintree a week ago, Third Intention returned to Cheltenham today where he showed his class with a stylish and easy win. This time he settled very well despite the few runners, jumped faultlessly and quickened away to win by 4 lenghts. Third Intention has now won three races and has been second twice. His next and last target before his summer holidays is the Gr. 1 Champion Juvenile Hurdle at the Punchestown Festival. 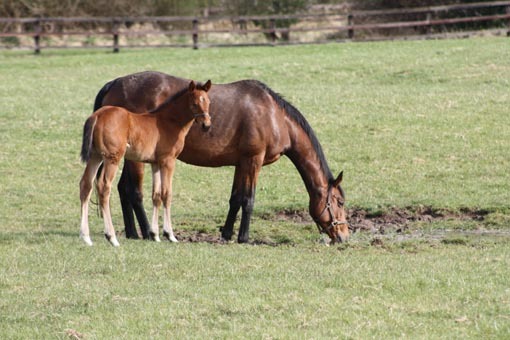 We are still waiting anxiously for most of our mares to foal and it is getting very late now for commercial foals which are due to be sold in November and for getting their mothers back in foal. But there is no hurrying nature and we just have to sit and suffer, or more appropriately, lie in bed and look at Mares-not-foaling-TV! 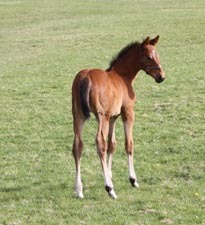 However we are pleased to report that all three mares we covered so far are pregnant. It is very exciting to have brave four-times winning Theola in foal to Azamour and we are sure that the Renk familiy who have leased Theola is very excited about the progeny to be. Our Mastercraftsman filly is growing well and we are pleased to report that Sogno Verde is in foal to Breeder's Cup winner Raven's Pass.